It was a chilly Wednesday night when I had just got home. The rains were heavy and it dawned on the city as though it was sent to cleanse the streets of Nairobi. I was getting comfortable at home when I got an email that my blog had been nominated for BAKE awards. My jaw dropped. I was in utter shock and I had to tell the person who had called me to confirm that he was referring to me.I was thrilled with the news. My feet could not contain themselves. I began dancing. Dancing with joy. I just could not believe it.! 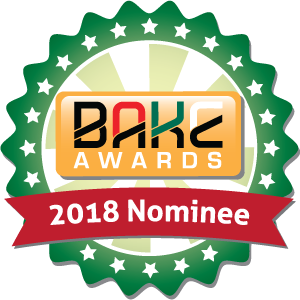 A nomination is a big step.Words can’t express how I felt when I got these news that I have been nominated for BAKE Awards. Some people think its a Baking contest meant to showcase people’s baking skills. But I’m here to rectify that it stands for Bloggers Association of Kenya. My blog has been nominated for the Best Fashion and Style category. This is one of the best moments in my blogging journey and I am grateful to God, my family, friends for supporting and believing in me. This has been a very great experience so far for me because I have learnt a lot. Many of you, have asked me what motivates me? How have I managed to get here? If I enjoy blogging? To my lovely readers, if you do not go after what you want, you will never have it! If you have always wanted to start a poultry farm, blog, business, vlog or whatever you have in mind, start and go for it! Don’t wait for your ancestors to blow the horn in your dreams.! No dream is too big to achieve in this world, it’s a matter of believing in yourself, making it happen and above all praying for guidance from God for he is the one that holds your beautiful future. Vote for me on https://vote.bakeawards.co.ke/ Fill your names, email address, and number. Scroll all the way to No.7 Best Fashion and Style Category, Select choice(d)https://www.thefashionmobster.com/ Scroll again, till you see a sum that you are required to answer and submit. You will be directed to a Verification page that will require you to fill a code for verification which has been sent to your phone via SMS which is from Info Alert, Verify and you vote successfully! You got some very unique fashion ideas. Go on u r here to win it! We are for winning gal..go,go,go. Just voted……I trust you’ll take the crown.. Very interesting details you have noted, thanks for posting. “Nothing ever goes away.” by Barry Commoner.